FILE - Democratic candidate for Georgia Governor Stacey Abrams speaks during an election-night watch party, May 22, 2018, in Atlanta. 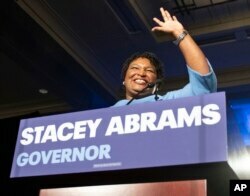 Abrams recently showed that she can mobilize the power of black women voters in her close but unsuccessful bid to become Georgia's governor, and Democratic leaders are hoping that her selection to give the prominent address will energize the party's base. "She is just a great spokesperson. She is an incredible leader. She has led the charge for voting rights, which is at the root of just about everything else," said Senate Minority Leader Chuck Schumer. Schumer, along with other top Democrats, have been urging Abrams to challenge Georgia's Republican Sen. David Perdue, one of President Donald Trump's most outspoken allies in Congress, as part of an effort to gain Democratic control of the Senate. While Abrams narrowly lost the Georgia governor's race last year to Republican Brian Kemp, her presence at the top of the ticket boosted Democratic votes in the state and helped other state Democrats win office. The fact that Abrams, 45, nearly won the governor's race in the reliably Republican Southern state has been seen by Democrats as reinforcing her ability to gain supporters and energize voters. FILE - Georgia Democratic gubernatorial candidate Stacey Abrams speaks to supporters during an election night watch party in Atlanta, Nov. 6, 2018. Abrams is a Yale Law School graduate who was elected to Georgia's General Assembly in 2006. She rose to lead the Democrats in the assembly, taking over as the minority leader in 2011. She was known by her colleagues for being well-prepared, a good listener and someone who inspired others to trust and follow her. Although she ran unapologetically as a liberal, she was still able to earn the respect of many of her Republican colleagues and work with them across the aisle. Abrams has said she is "honored" to be delivering the response to the State of the Union address. She has said that she intends to "deliver a vision for prosperity and equality, where everyone in our nation has a voice and where each of those voices is heard." "Stacey Abrams embodies the American Dream, and her powerful message of progress for all is deeply needed during this time for our country," House Speaker Nancy Pelosi said.